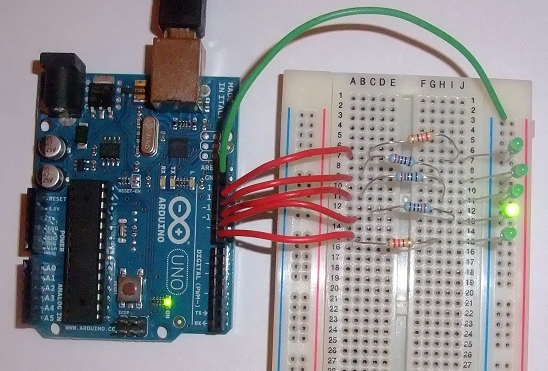 In this Arduino UNO tutorial, we are expanding on our simple LED flash tutorial. We will use 5 LEDs to create a simple Cylon roving eye effect. To do this we will make life easier for ourselves and use direct port manipulation. That is we will write directly to one of the Arduino UNO ports rather than writing to individual pins. This allows us to set the values for each of the LEDs in one operation. There are two bit shift operators: the left shift operator << and the right shift operator >>. These operators cause the bits in the left operand to be shifted left or right by the number of positions specified by the right operand. Now to the code, which is shown below. We need a couple of variables, one (upDown) to indicate whether we are moving up or down the port LEDs and another (cylon) to indicate which LED should be illuminated. In setup() we define the port pins required as OUTPUTs. In the main loop(), if we are going up the LEDs we increase the cylon variable by 1 and test to see if we have reached the last LED, if we have then we set the upDown variable to be going down. Similarly, if we are going down we decrease the cylon variable by 1 and test to see if we have reached the first LED, if we have then we set the upDown variable to be going up. We then light up the correct LED and wait a sort while before starting again.